Ms Mel and ODNT Are giving you 10 minutes to write something, anything. I’m on my way to Chicago tomorrow morning, returning home Friday. I will post pictures and stories upon my return. Until then, I began to think about whatever travels we go on, we somehow seek home again. What is home to you- Where the heart is? Where your hat is hung? The newly defined dwelling that love turns a house into? For me it was an apartment building where I spent my formative years. 18 years to be exact, and we lived on the 18th floor. We had 3 bedrooms, 2 bathrooms and a balcony. I would sit out there on summer afternoons and ‘plane spot’ – the route to one of the airports was along the way and I would read the rear wing design. Most were American Airlines, sometimes I would see something unique. Alaska Air had an Eskimo on it. I even went to the liberry once and found a book with an entire index of them. The Concord would roar by at 8 or 10 am on weekends, cutting through the air sharp as it looked. I’ve moved several times since 1995; lived in a house for 3 years, then my parents bought a co-op. I would buy one nearby a couple years later, where I still live. Still in Brooklyn. I am a vivid dreamer. Colors, words, sounds, the whole shebang. Emotions and tension as well. A vividly detailed dream can be over-stimulating even if it’s a good one, and for someone who watches horror/thrillers, played Quake almost exclusively for several years and used to listen to death metal all the time, you can imagine the types of dreams I had. Sometimes I had to get home – for safety, or pick up something, a home base…not sure. It could have been any of those reasons. It was, many times, run-down. Not always post apocalyptic. But something that fell into disuse and disrepair. Things did change when we were moving, criminal elements started to move in and we really were forced to get out asap. Not the terms we wanted. But still there was something that made me go there. Nowhere else. I would reach my floor and sometimes just reach the door but never got in. Never got to that balcony again. Never looked out my parents window at the NY skyline with the twin towers still standing. Guess I never truly made it home again in those dreams, maybe the new ones became more real . Ms Mel and ODNT want to know in 57 words or less, or more, anything at all!. I was pretty good with last year’s resolution (and I have 3 receipts from this week to go through), and around two years ago, I found out I had already set this blog in motion. So if anything, the new year is a great excuse to get back into it. Every year I am healthy, working, respected and not worrying about finances is a better day than a lot of others. However, 2013 took a downward turn on many levels which I will not get into, and I am going to have to work harder to make 2014 more memorable, since a regular pace will not give me the impression of momentum. So, some ‘lofty’ or at least numerous goals, most of which will be documented in this blog, which means more for you to read (yay?!). • 120 blog posts – 1 every 3 days average, very doable. Yes Mr. G, you have gotten used to my in and out on posting, slamming the screen door every damn time as well. I am sure most of you have. I promise at least some consistency. • Keep up on reading you. Yes, you *Points to you*. I truly enjoy your posts. …and reviews of each one of these. • 12 photo posts (a month in photos-type dealie). • Meet the most famous and inspiring Ms. ODNT and MelMags, because, if you read them, you want to meet them and the ketchup costumes. Yes you do. • Beat every video game I have started (if this includes anything in the Grand Theft Auto series, it doesn’t mean get 100%, if this phrase means anything to you). • Be re-elected to the Staff council at work (I am the chair). However, this is voided if I achieve the goal; of a new, better job. • To whatever point I progress in or complete any/all of these, Enjoy every minute. Ketchup With Us 14 – Just More of Me to Love! Ms Mel and ODNT are often imitated/never duplicated, and they want to know, in 57 words or less, who your doppleganger is. I’ll take you on a photo journey if I have comparable pictures. These photos are mine, so I didn’t bother with clipart from websites – it’s Friday, KWU is almost over and I don’t feel like giving credits. As a kid, Joey Lawrence. and for this senior pic- Elvis. College – Ace Ventura, *no pictures – yet*. Most recently, with the beard – Obi-Wan Kenobi? I like to think so. I’m mind-tricking myself. Besides, Jedi Masters pop their collars. 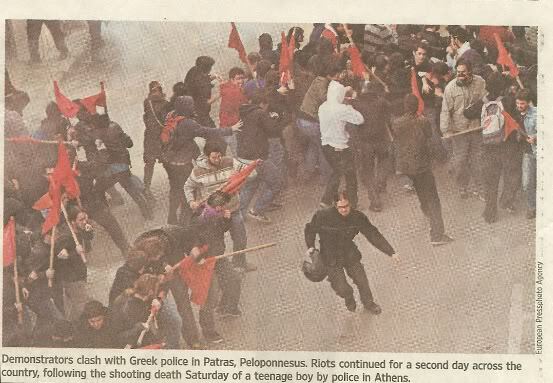 A co-worker brought this one to my attention – a protester in Greece!